81,3 x 117,5 cm - 32 x 46 1/4 in. 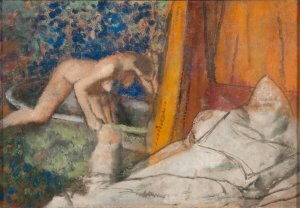 Atelier Degas – Vente Degas, 1918, I, n° 39 – Ambroise Vollard, Paris – Durand-Ruel & Cie, Paris, 1918 (Stock n° 11296) – Sam Salz, New York, mai 1949 (?) (Stock n° 11301) – Carnegie Institute of Art, Pittsburgh, 1962. Paris, Gazette des Beaux-Arts, 1955, n° 129, repr. p. 50 – Paris, Durand-Ruel, 1960, n° 45 – Paris, Ottawa, New York, 1988-1989, n° 337, repr. p. 545 - Boston, Paris, 2011-2012, fig. 199, repr. p. 188 (Boston seulement) - New York, Museum of Modern Art, 2016, n° 171, repr. p. 221. Lemoisne, 1946-1949, III, n° 1029, repr. p. 601 – Degas in the Art Institute of Chicago, 1984, fig. 76.2, repr. p. 162.